Sharon Simmons and her husband Charles Sr. decided to stay in their home on Mathis St. during Hurricane Harvey. It was a decision they ultimately regretted. Their home did not fair well to the strength of Harvey and it forced them to huddle into a small room of the house where they remained safe and rode out the storm. The house suffered catastrophic damage. They were forced to move into an apartment complex in Corpus Christi with their four granddaughters, Alisa, Khloe, Alyson, and Madison Simmons. 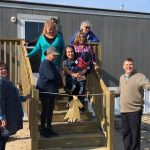 They commuted to Rockport when they could and the four granddaughters began to attend school at Blanche Moore Elementary. After attending a church service in Rockport, Sharon was pointed in the direction of the Coastal Bend Disaster Recovery Group (CBDRG). She applied for help with the CBDRG. 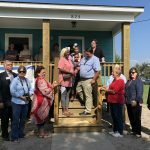 In time, Sharon, Charles, and their four granddaughters, were selected as candidates to receive a new home on their own property. During the time before receiving the new home, Sharon also lost her twin sister. She planted two tangerine trees outside her new home in her memory. “Us being twins, the bond that we had … it was so that we’ll blossom together on this property,” said Sharon. Before her grandkids left school at Blanche Moore to come back to Rockport, Sharon cooked an early Thanksgiving dinner for the whole staff to show her appreciation for taking in her granddaughters and treating them like family. Alisa, Khloe, Alyson, and Madison are excited to be back home in Rockport. They’re excited to be Pirates again. “Once a Pirate, always a Pirate!” They proclaimed. They said that Corpus just wasn’t the same as Rockport, and they missed it. “They were country girls going over to the city,” said Sharon. Construction on the new home began in mid-August and was built by Mennonite Disaster Service (MDS) and Christian Public Service. Every house is built to the Texas Windstorm Insurance Association standards and built to withstand future storms. Funding was provided by a combination of MDS, CBDRG and the Rockport-Fulton Chamber Foundation. Zavala’s Furniture donated one of the mattresses in the girls’ room and additional furniture was purchased through a grant from Save The Children. The home was also filled with perishable and non-perishable food items courtesy of the Coastal Bend Food Bank. Sharon plans to give back to the community by volunteering with CBDRG and other organizations while her granddaughters attend school. “Coastal Bend Community Foundation has been privileged to receive Hurricane Harvey recovery donations from those throughout our country. 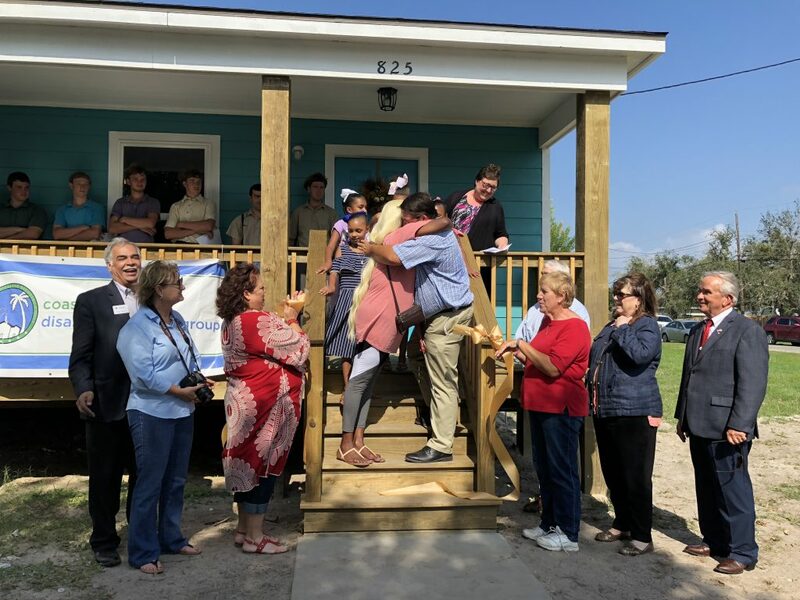 To see our partnership with the Coastal Bend Disaster Recovery Group, aided by so many volunteers, come to fruition though the completion of this home for the Simmons family is a testament to what can be accomplished when we all work together for our community,” said President & CEO of the Coastal Bend Community Foundation Karen Selim. CBDRG, in partnership with a number of other non-profits, is currently working on 116 major reconstruction projects with 49 projects completed this past year and are currently seeking volunteers, from skilled-laborers to general help. If one is interested in volunteering, visit their website at www.coastalbenddrg.org/volunteer.